Posted by Amisha Kadiwar in Travel Log. For our last trip, we headed to the island, Amantaní. 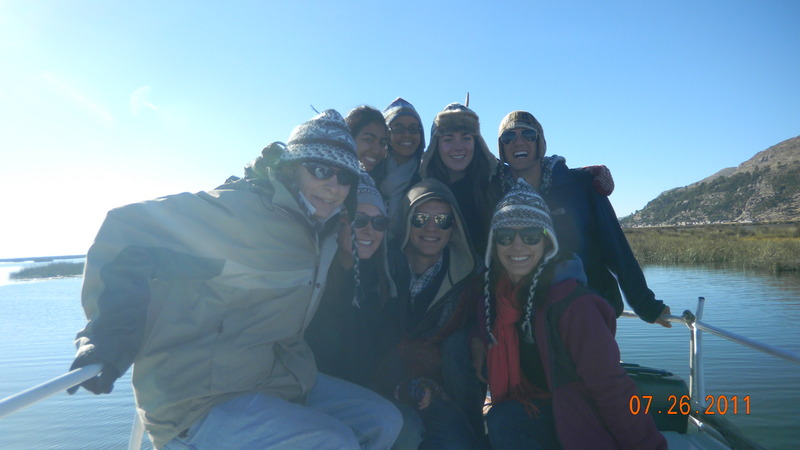 A 3 hour boat ride would take us across the highest navigable lake in the world, Lake Titicaca. The lake was HUGE. Apparently, the size of Puerto Rico. As we moved further from the mainland, it got chillier. The wind on the lake was cutting and strong. Every direction was a vivid blue with the mountains peeking out in between. We sat at the top on the high deck for a while and marveled at the enormity of the lake. We started approaching a little island and pulled into the dock. 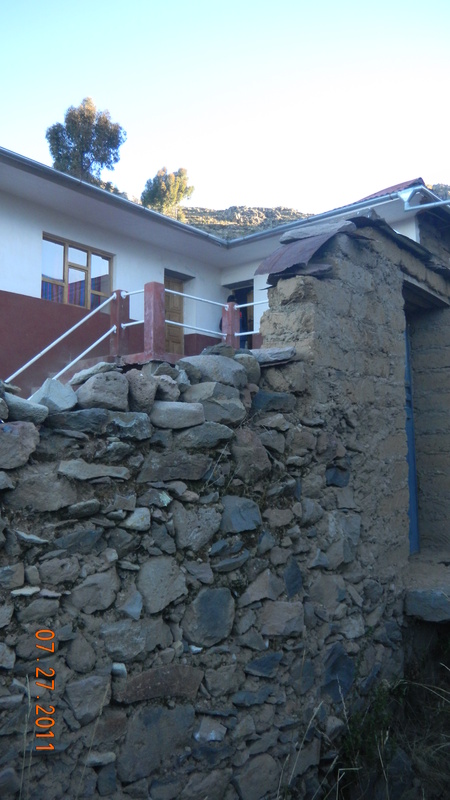 As we gathered our duffels, we were told that our host families for the night lived 45 minutes up the mountain. We hoisted up our things and prepared for the trek. The altitude there was a bit higher than that of the Potato Mountain we’d climbed, and like then, we endured some struggle times climbing with so little oxygen. At our village, we were greeted by our host mom, a tiny lady who came up to my elbows. Apparently, the main source of income for these rural families comes from groups like us who take excursions to the island. The various communities living there take turns hosting tourists every week. Overall, the island is home to about 8,000 people. Our mom led us around a soccer stadium (even the most rural islands LOVE soccer) to our little house. Our room was much nicer than we expected. From what we’d heard we practically expected to be sleeping in barns on straw cots or something. We actually had a little loft room with 2 beds and small windows. The bathroom was downstairs and around the corner. It, however, had no running water so I had my first experience flushing a toilet with a bucket. After dropping our bags home, we went to see the island’s parade for Peru’s Independence Day! I was so impressed at the construction of the town stadium. For being on an island with no electricity or running water, the stadium was grand. We watched the school kids march with flags and older people dance in various styles. After the parade, our families brought us an authentic lunch on the hillside. We all sat in a huge circle as they rolled out a blanket filled with potatoes. We sat in the dirt looking out at the great scenery. Lunch was followed by a climb to the highest mountain peak in the center of the island. 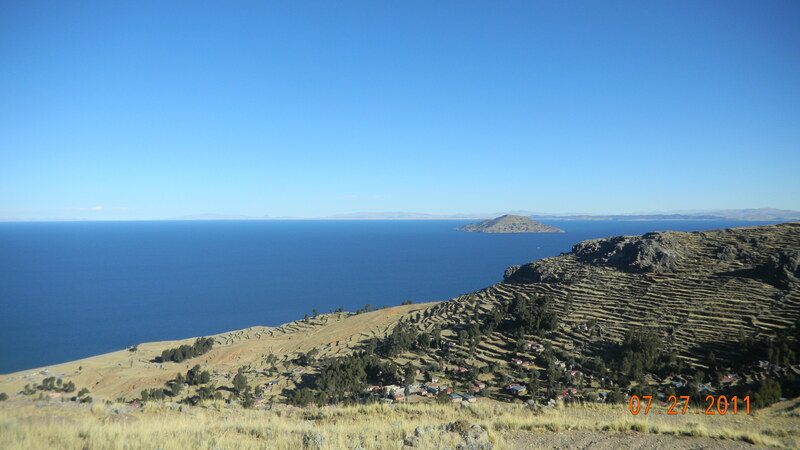 From there you could see all the tiny village homes and the never ending Lake Titicaca in all directions. When we returned home, we watched the sunset through our loft window and our family called us down for dinner. The kitchen was in its own little building, which was basically a plain little room with a dirt floor and one small table. There were no appliances or such, just a fire with some pots hanging over it. It’s hard to believe that in 2011 people are still living in such simplicity. They make a 3 hour boat ride twice a week to get food from the mainland! After dinner, our mother dressed us in traditional indigenous clothing and took us to the town hall to meet the rest of our group for dancing. We all looked ridiculous but had some good laughs and good fun. On the way back from the dance, we stopped at the soccer stadium to lie and look at the stars. The night sky on the island was the most beautiful I have EVER seen; even better than the planetarium/observatory in Cuzco. I didn’t even know the sky could have so many stars. You could even see the strip of the Milky Way. As we lay there in awe, I waited for a shooting star. Everyone had gone on and on about seeing them in Cuzco and I figured if I was ever going to catch sight of one, it would be here. After a few short minutes, I saw a star fall across the sky; just like the movies! The night was cold, but it wasn’t as bad as we’d been expecting. Sleeping, the blankets were so heavy you could barely flip over. The next morning, the sun rose so early and shone brightly through our windows. We packed up our things and walked down to the docks to catch the boat for our next island adventure. Another long boat ride brought us to Uros, the handmade floating reed islands. The islands of Uros were so curious. None of us could understand why these families made their own islands (you could literally walk across from one end to another in less than two minutes) instead of living on the many mountains in the lake. Uros was made of 22 small islands each of which housed about 3 or 4 families. They explained to us how the islands were made and how they anchor themselves down to keep from floating all around the lake. Our guide mentioned too that if neighbors have trouble getting along, they simply saw through the reeds to split the island in half! It really was a strange sight. I also finally got the chance to give away the 5 pounds of crayons and paper pads that I’d been lugging around for days up and down the mountains. The children on the reed islands have very limited resources and were so happy to receive the little gifts. After Uros, we headed back to Puno and our hotel. I can’t believe how different the two worlds were: the island villages and the city of Puno. Such a drastic change in such a short distance..
Friday was spent all day on the bus back to Cuzco. 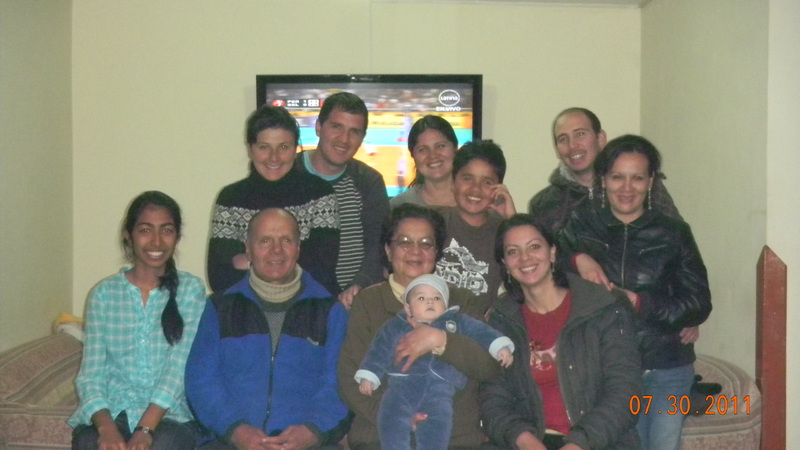 It was so nice to “come home.” I really love my family in Cuzco! They were so happy to have us home and we spent our time together looking at pictures from our trip. I can’t believe I have been here for 6 weeks! As much as I’ve enjoyed my time – I’ve had some truly once in a lifetime experiences – I am so excited to return home, to Atlanta! I think that what I’ll miss most besides my wonderful family are the mountains and the sense of always feeling in the midst of an adventure. I have made some great friends and look forward to more trips in the future! We took the bus up the mountainside to get to lunch. On the way up, we stopped many times to wait for the sheep, cows, or chickens blocking the way. We were even asked to get out of the bus as it crossed a weak wooden bridge in order to lighten the load. By the looks of it, good thing we did! Lunch was served on a hill overlooking the lowlands. We all sat in a big circle on the ground and enjoyed different potato dishes. After lunch, the bus dropped us further up to begin our trek to the lagoons of the Andes. We had been warned that our hike would be rough. Cuzco, where we stay on a normal basis, is about 3300 m above sea level / about 10,800 ft. Even at that altitude, you have to stop to catch your breath. The hike today was through peaks at 4600 m above sea level or 15,090 ft. We began walking along a trail that led us to a gorgeous view of the lakes below. We were literally in the middle of nowhere: no villages in sight, no buildings, no other people JUST MOUNTAINS EVERYWHERE. As we came upon an expanse of land where sheep and llamas grazed free, our guide asked us to take a vote. 1) Go back the easy way – about 45 minutes along the trail or 2) Go back the hard way – about 2 hours up to the highest peak to see some incredible views. Of course, we all voted for the hard way. We couldn’t come all this way and miss out on any excitement. But, we didn’t realize just how hard it would be. As we ascended further and further, the trail became non-existent. We were practically climbing up the mountain any which way we could, gasping for breath at every step. The air was so thin and many of us began getting headaches. Just when I was nearly ready to throw up (“soroche” aka altitude sickness can really get to you! ), we reached the top! Laying down in the sun and breeze was the best feeling ever, and the view of the other lagoon was definitely worth the effort. We spent a good 30 minutes relaxing on the peak then rounded the other side of the mountain. The way down, although also without a trail, was much easier and more relaxing. It seems every new excursion we visit, uncovers something more of Peru. Something different. The lagoons today might be my favorite sight yet, coming really close to even Machu Picchu. 5:49 am. I heard our Peruvian dad, Obed, from downstairs, “Señoritas?” I managed to mumble out a “Si, gracias Señor.” I have not seen a time so early in a long, long time lol. After a quick breakfast, we hustled over to the Parque Amauta, our regular meeting place, to find the Centro Tinku bus. The ride was about an hour to Poroy where we boarded the PeruRail train to Machu Picchu Pueblo. The scenic train through the Andes was fantastic. We were actually traveling down to an altitude much lower than Cuzco so the mountains seemed to grow taller and taller. At first, there were farmlands with cows, llamas, and pigs, rows of produce and even a few flower farms. Then, an hour or so into the ride, a rushing whitewater river began running parallel to the train. As if the mountains themselves weren’t beautiful enough! The flora also changed into a more jungle looking environment with springs flowing from the rocks and exotic flowers and vines dangling down. Apparently, the location of Machu Picchu is the transition between the landscape of the Andes and the beginnings of the Amazon Rainforest. Three hours of a train ride finally brought us to the Pueblo. We took another short bus ride and arrived at the base of the Incan site of Machu Picchu! Everybody was tingling with excitement at the thought of being moments away from seeing a wonder of the world! Just like all the other Incan sites, we hiked up quite a number of hills and windy stone stairs before coming upon the view. And what a view it was! I kept thinking of all the traditional Machu Picchu pics I’d seen plastered all over Cuzco, and couldn’t believe I was seeing it now myself. There was even a llama grazing on the hillside. In every direction, the green jungle mountains surround you and you feel like just jumping out into nature. We continued down into the site itself and came upon a huge ledge that fell into the valley below. The breeze was strong and the air so fresh and clean. The ledge overlooked the whitewater river below and the original Inca trail that zig-zagged up the neighboring peak. It was by far the best part of the site. As we continued to hike around, we could see the many aspects of Incan life that we’d learned about in class. It’s so fulfilling to see what you’ve learned about and makes class a hundred times more effective than textbook teaching. Our site exploration was followed by lunch. We always have the best meals on our excursions! Maybe we just enjoy anything after all the trekking lol, but I’m pretty sure the food is really good. On the way back, the train ride put us again in the midst of the mountains which this time looked like huge black clouds filling the entire night sky. The great Machu Picchu adventure came to an end as we took the bus back to our homes in Cuzco. It’s so surreal to have visited such an extraordinary place. The sites in Peru inspire you to want to travel all around and see what the world has to offer. Where to next summer?! Happy July! Yesterday was the first day of our new class with Dr. Galloway. 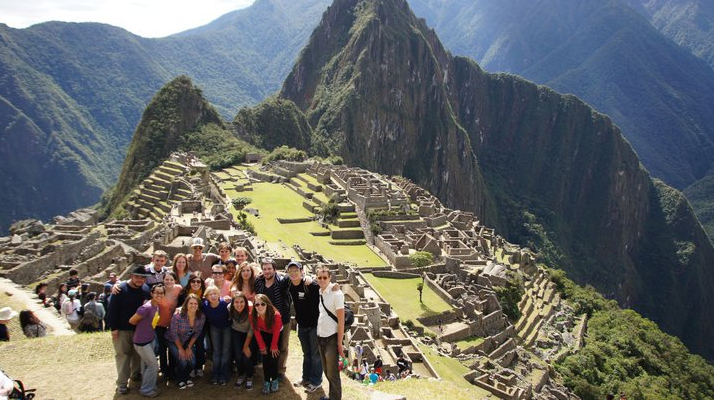 We delved into an overview of Peru and its history, and then Doctora each of us why we here. I’ll be honest, my first few days in Cuzco, I wondered if I would enjoy six weeks in my new home – the simple life: no car, no heat, no internet. So, why am I here? My main reason was to be surrounded by Spanish and improve my language skills. It’s a great feeling to put to use your classroom Spanish and see that you can communicate with ease. However, I have been surrounded by much more than just Spanish. In just two weeks, I have seen more displays of tradition and culture by the Cuzqueñan people than I have ever seen anywhere else. I am so grateful for the opportunity to experience day to day life in a South American country and see Peru in a more real way than the average “Machu Picchu” tourist. Today was an excursion to Moray and the town of Urubamba. On the ride up the mountain (we pretty much head up somewhere deep into the mountains every time we visit any Incan site), the rain started up again. Three days of rain in the dry season is such a rare site! We stopped to visit a ceramics artist while we waited for the weather to subside. Through his hand-made pottery, the artist strived to preserve the Incan form of art. He explained how he brings the earth from the mountain to make his own clay and demonstrated some pottery-shaping and design-drawing for us. On average, his works take months from to complete with some of his larger pieces requiring much more attention. His craftsmanship was incredible, and none of us could leave without a piece of his work. Finally, the rain subsided enough for us to explore the site of Moray. In earlier times, it served as an experimentation grounds for Inca agriculture. The landscapes were simply breathtaking. In fact, they were literally breath taking haha.. The altitude and slippery mud made climbing up and down the site quite a feat. We were so high that we were walking through clouds! After Moray, we visited some other traditional Incan artisans at a weaving hut. The ladies made thread from sheep and alpaca wool, created their own dyes, and worked for endless hours to create intricate works of art. We watched some demonstrations and then browsed their store. After a day of walking through the rain, hardly anyone could feel their toes, and we rushed to buy some plush alpaca slippers. As we left the weaving hut and took to the bus to warm our feet, we were stopped by the view that had appeared between the clouds. We could now see that the taller mountains all around us were covered in snow! It’s so crazy.. some days we are sweating in the Plaza and other days we are shivering in the hills. Peru is truly a fusion of opposites: hot and cold, old and new. Atlanta to Lima; Lima to Cuzco… and I’m here! 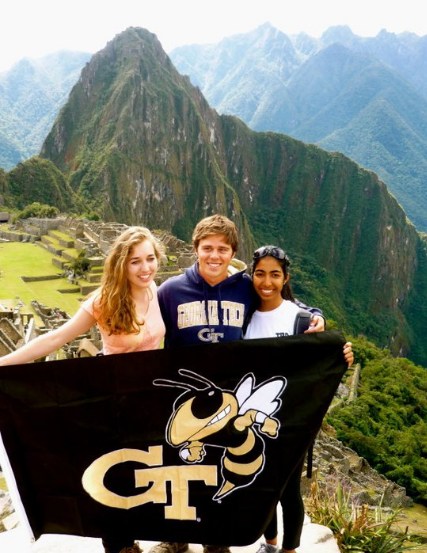 For the next six weeks, I’ll be participating in the Peru: Culture and Community Study Abroad Program through Georgia Tech. 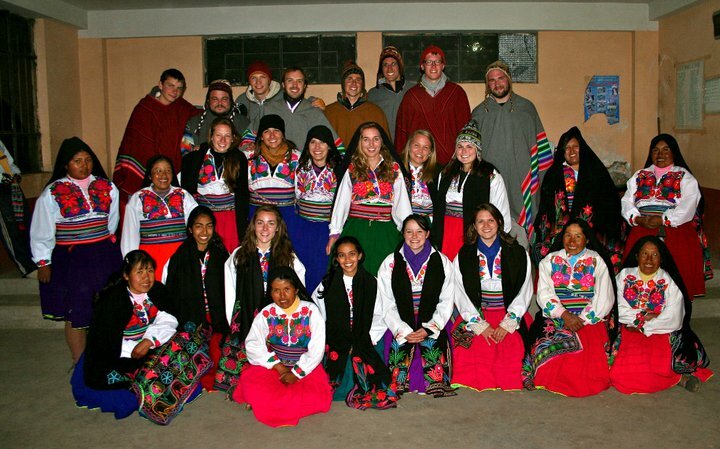 I’ll be studying at Cuzco’s community school, Centro Tinku, and living with my host family, Familia Cartagena Sotomayor. It’s a couple days early from the start of the program, but I wanted to get settled in and get things together. My dad flew with me to see Peru for the weekend, and it was definitely nice to have a travel buddy! We checked into a hotel in Cuzco, and set out to see the city. The landscape is beautiful! It’s neatly tucked into the Andes mountain range which makes for great scenery all around. There are shops lining every street and noisy little cars buzzing around in a hurry. And, since I love animals, I was sure to notice the many dogs – sniffing, sleeping, or strolling along. Dad and I wandered down Ave. El Sol, the main street in Cuzco which lead to the Plaza de Armas (a sort of city center). It happened to be hosting festival! The Plaza was filled with colorful floats and people. So many people! Here are some snapshots of our walk. So far, it’s been a long and exciting day, and just a glimpse of the program ahead. Can’t wait! I look forward to updating you all on my travels!